While technology provides a plethora of options for telling time these days, a hunting watch is a great investment. Designed to be durable in harsh conditions, easily accessible when you’re out on the trails, and visible in low light, hunting watches offer a reliable and smart way to stay informed while hunting. There are several reasons this is a good choice when you are out on the trails hunting for game. Not only does a good hunting watch tell users the time, but it can also provide vital information. With thermometers, compass features, altimeter, and barometer technology, you’ll be more in the know than ever before. In addition to allowing for greater preparedness, one with an alarm or stopwatch feature may be useful for keeping track of time on the trails and never missing a beat. Some have GPS technology or can be synced with a smartphone for easy access to the data you collect. Even if timekeeping is your only prospective use, hunting watches are generally super easy to see in bright sun or low lighting due to anti-glare or backlight features. Remember these key aspects while reading through this review. The latest innovation in hunting equipment is solar power, which makes sense for those spending lots of time out in the sun. Many products use this technology, which can be beneficial in some cases, but perhaps not in others. If you like a more traditional battery style, or worry that it may not get adequate charging time, other options are available. Make sure you choose a battery for your lifestyle and consider its lifespan as well. Do you need an item that simply keeps time, or are you looking for a compass, thermometer, GPS, calendar, or moon phase feature as well? Depending on your hunting style and location, you may need a variety of features, so be sure to check the capabilities of the product before purchasing. If looking for something more basic, you might not want unnecessary bells and whistles to get in the way. Hunting watches are generally very sturdy and similar to military watches, but they are all different. Most are water-resistant, but some are fully waterproof while others can actually be submerged and used for diving. The longevity of your battery and general materials it is comprised of also impact how long it will last. Lastly, make sure to get one that fits! This can be determined by measuring around your wrist and comparing it to the dimensions of the band. No matter how amazing a wristwatch is, if it falls off or is too tight to fit on in the first place, it won't work for you! It is also important to check the materials of the band, to make sure it will fit comfortably in every way. 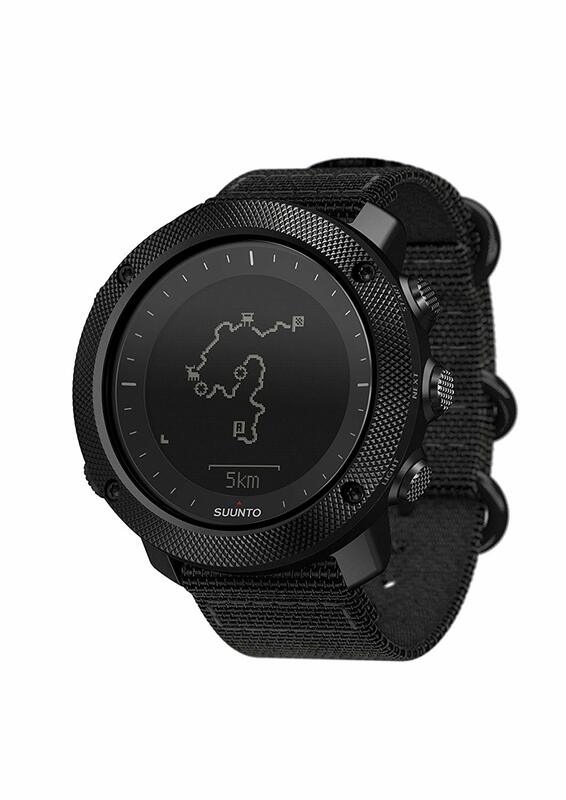 Suunto Traverse Alpha has GPS so you can always find your way. Not all hunting watches were created equal, but each has a unique set of features that is the perfect design for someone! To make your search easier, here are detailed reviews of some of the best hunting watches available. The Men’s Pathfinder Triple Sensor Multi-Function Sport Watch is the best overall hunting watch. With a stunning and compact design, this product is durable and has amazing features sure to cover the bases. Firstly, this incredible unit is totally solar powered. With a panel on the face it can stay charged for a full six months without exposure to light. It has a multitude of features to fit any hunter’s needs, including a digital compass, altimeter, barometer, thermometer, EL backlight, world time function, city code display, five daily alarms, 1/100 second stopwatch, full auto calendar, countdown timer, and battery power indicator. It also can be displayed in 12 or 24-hour format and has a battery saving function to ensure a long lifespan. This device is water-resistant to 330 feet and is suitable for heavy rain and even swimming or snorkeling. With a 51 mm stainless steel case and mineral dial window as well as quartz movement with digital display, this gorgeous piece is also durable and strong. It features a resin band with buckle closure that measures 57.3 x 50.9 x 15.3mm. Overall this is an amazing quality product that is good for all basic utility purposes. It is not only solar powered, but durable and ready to face the elements, and is decked out with just about any feature you could want. The Garmin Fenix # HR watch is rated the best GPS hunting watch. This piece is durable and tough, with protective PVD-stainless steel bezel and buttons, a treated silicone band for comfort and resistance to discoloration, and reinforced housing to ensure long-lasting performance. Designed to be visible in any lighting, this watch has a Garmin Chroma Display with LED backlighting to ensure crisp viewing at any time of day or night. With a rechargeable battery that lasts up to 40 hours in UltraTrac battery saver mode, 16 hours in GPS mode, and 2 weeks in smartwatch mode, you won’t have to worry about stopping to charge while out on the trails. It is also water-resistant for up to 100 meters, making it suitable for heavy rain or swimming. One of this product’s most desirable features is its Garmin Elevate wrist heart rate technology including advanced running dynamics with vertical oscillation and vertical ratio, VO2 max, and recovery advisor, which adds a fitness/health aspect to this utilitarian yet fashionable piece. It also utilizes omnidirectional stainless steel EXO antenna that integrates with Galileo/GPS/GLONASS satellite reception and is able to track in challenging environments, and can be wirelessly connected via hotspot to automatically sync your data with Garmin Connect and update software when in range. This is an amazing choice, especially for those looking for GPS technology. It can connect wirelessly via hotspot to sync your data, and provides a durable, yet comfortable, finish. 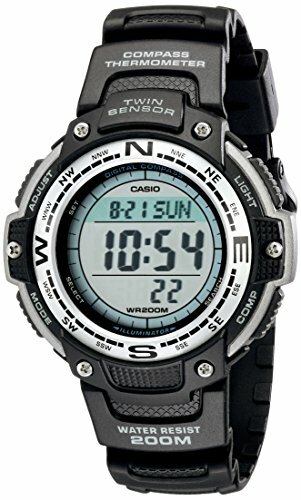 For Casio fans, the best offering from this brand has to be the Digital Compass Twin Sensor Sport Watch. This practical device has everything a hunter needs from athletic performance to everyday wear. With a CR2 battery and a three-year lifespan, this modern piece is perfect for anyone sick of waiting around for recharging. Not only is it reliable, but the band is flexible and has an adjustable buckle closure for comfort and a sleek round dial with polished, silver accents and stylistic designs on all components. Its bright and clear day, date, and month display allows for easy reading in any lighting. It also has a 1/100 second stopwatch, alarm functions, protective mineral crystal to prevent scratching, precise quartz movement, and is waterproof up to 660 feet. This is obviously made to last in any conditions, which is perfect for hunting. This twin sensor model also sports a direction and temperature sensor, which are displayed in a large, easy to read manner. 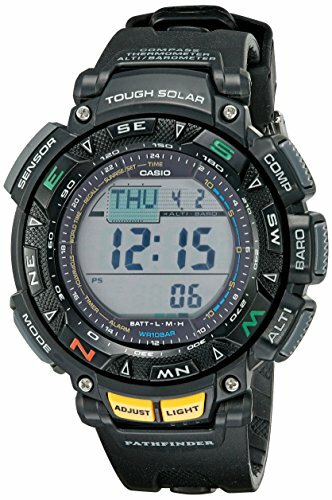 This is a great candidate if looking to stick with the Casio brand. It has both direction and temperature sensors, is easy to read in all lighting and weather, is designed to last and resist wear, and looks good all the while. 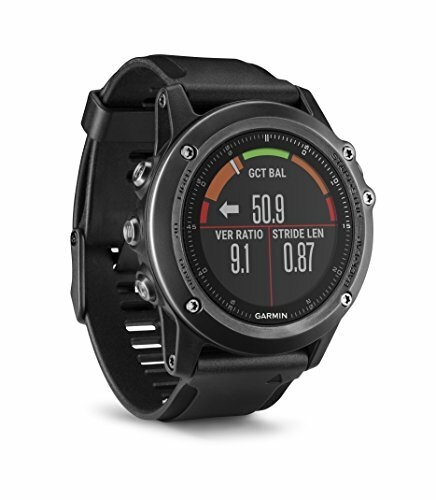 The Garmin Instinct is a durable watch made to withstand any harsh conditions. It was manufactured to the U.S. Military standard 810 G for water, shock, and thermal resistance, and still manages to avoid bulkiness. This beautifully designed piece also has a three-axis compass, barometric altimeter, and GPS plus GLONASS and Galileo that help track your movements in challenging environments. 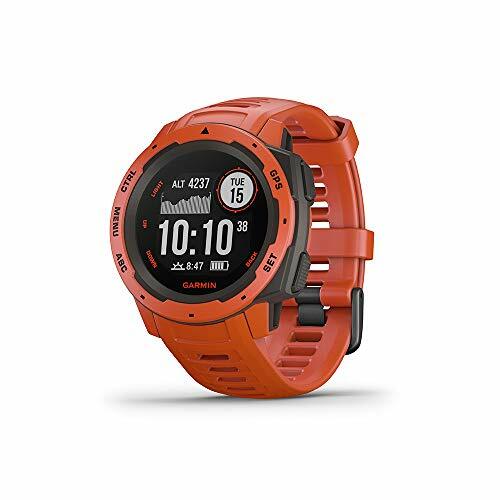 This product makes no compromises, featuring TracBack technology which allows users to return to their starting point vial the same route or use the Garmin Explore app or website to plan routes in advance, because it can be wirelessly connected via smartphone. Not only can it receive smart notifications, but it can upload data to the Garmin Connect online fitness community. It also allows users to keep in touch with their exercise plans by monitoring heart rate and can be preloaded with activity profiles for easier training. Even with all that, this watch still has a powerful battery whose lifespan is up to two full weeks in smartwatch mode, 16 hours in GPS mode, and 40 hours in UltraTrac battery saver mode. Overall, this is an incredibly durable and versatile offering, equipped with all the features anyone could ever want. With a GPS that allows backtracking, long battery life, and smartphone compatible fitness technology, it is a perfect choice on and off the trails. 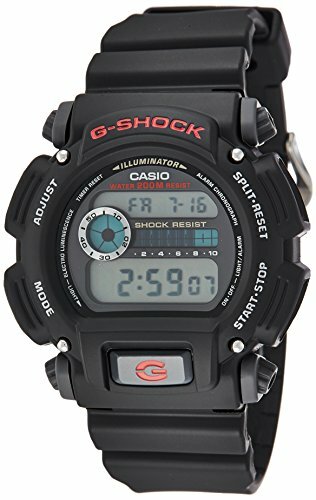 The Casio G Shock Quartz Resin Sport Watch is a great classic product with amazing features. It is both shock-resistant and water-resistant up to 660 feet, suitable for rain and even surface water sports. This item has a multi-function rectangular dial with afterglow EL backlight allowing for clear viewing in any lighting, perfect for dawn and dusk on the trails. With a daily alarm and countdown timer, 1/100 second stopwatch, hourly time signal, auto calendar, and 12/24 hour formats, this product completes most tasks with ease. This lithium metal battery-powered piece comes in a 48.5 mm resin case with mineral dial window and quartz movement with digital display for a gorgeous finish and easy viewing without compromising durability. Overall, this is a great basic G Shock watch. It has all the necessary features and is built to last. Easy to read and made from strong materials, this may be a hunter’s best friend. 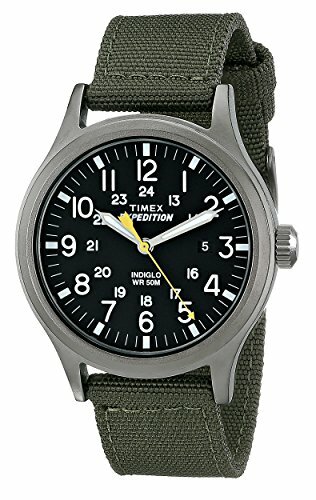 The Timex Expedition Scout 40 Watch is rated the best Timex hunting watch. This military model takes both comfort and style into account and is aesthetically classic while remaining functional for hunting. Firstly, it is water-resistant to heavy rain and features an Indigo Light Up dial for viewing ease in different lightings. This product offers amazing style, with an analog face and Green Nylon Slip-Thru 20mm strap. It is reportedly comfortable and keeps good time with easy-set quick date and Luminant Hand features. Not only is this device stylish and functional, but it is durable, coming in a 40 mm black brass case with a mineral glass window to reduce scratching. If you’re a fan of the classic look and function, this is perfect for you! Overall this product offers aesthetically classic and solid functionality. It has a comfortable band and light features that allow it to be viewed with ease any time of day. It is a good basic option for hunting as it is water-resistant and made of durable material. 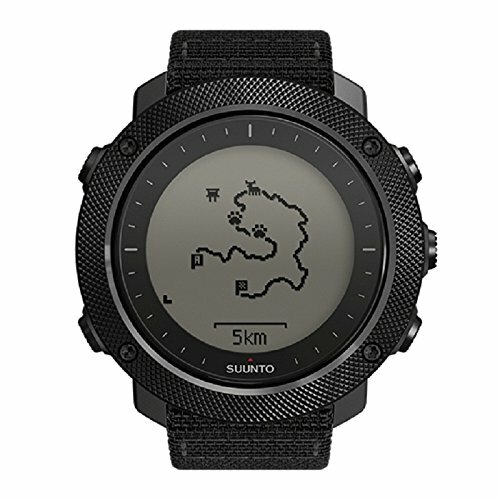 ​The Suunto Traverse Alpha is rated as the best watch with moon phase. It is extremely durable, featuring a knurled stainless steel bezel, water repellent nylon strap, and scratch-resistant sapphire crystal glass. Sure to last a long time, this product is military standard and handcrafted in Finland for a sleek finish. With sunrise alert, weather trend alert, and red backlight for nighttime use, this is the ultimate hunting partner. It not only has GPS technology, but also features automatic shot detection which keeps track of where you shoot via map for future viewing. It also has backtrack technology so hunters can leave the same way they came, and always find their way back. Overall this classically designed product is full of amazing features. Not only is it equipped with GPS, shot detection, and backtrack technology, but it also is smartphone compatible and helps determine the best time to hunt with moon phase indication. With many different options, choosing the right hunting watch can be overwhelming. Some have GPS technology and are smartphone compatible, while others are simple and durable. Depending on your prospective uses, make sure to choose a watch that can do what you need it to do while remaining comfortable. A watch should be something you are proud to wear and each of these amazing choices offers a great range of abilities while looking great.